My friend and I played this game today, and I haven’t played it since I was quite young. We absolutely loved the lengthy database of (mostly) ghettolicious names and their alternate spellings, but we mostly got a kick out of the name “Qecpfcnh” which apparently is pronounced “Candoline”. You should definitely check that out, it was hilarious. We thought it was maybe a mistake, but Qecpfcnn and Qecpfcne are pronounced the same way. I don’t really understand the logic behind it. Anyway, my friend and I made a short video of us playing the game, and it should be uploaded to my youtube account in a few days. I included the link with my name as I posted, so you should definitely check it out when it’s up. Sorry about the fact that I laugh so damn much haha, I think my laugh is kinda annoying. We also found giant sugar cubes and a huge diamond that was just laying around in the flowers outside. Trying to go to the maze (to the right of the greenhouse outside) would make the game freeze; did you have a similar problem with this? Really glad to find someone to share my amazing experiences with today, haha! I’m glad you found a hidden (if somewhat inadvertent) gem in this game. I didn’t get to the maze so I can’t confirm if I have the same bug. i have the CD but i lost the game in my old computer i still have the old computer but i don’t know how to take it out. Trying to reach the maze causes my game to freeze as well. 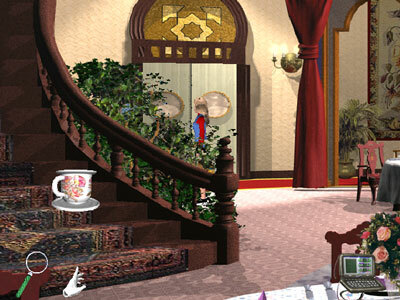 Also, in the room through the large doors in the back-right of the ballroom, there’s a boy that you can play a game with which will open up a secret passage. After entering it, the game freezes. And do the beach riding and boat mini-games just loop? I was never able to catch up to the other rider and gave up after a few minutes. The maze freezes my game as well, can anyone get this game working on anything besides windows 95/98/me? Here’s a video of some of the cooler names I found in the game, including my favorite Qecpfcnh. I have the exact same problem. My game always freezes whenever I go to the maze. When I played this game as a kid, it never froze. Now I want to share this game with my nieces and it won’t let me go to the maze. That’s like the first place you have to go in the game, isn’t it? How strange. I guess I’m not the only one who has that problem. But I wonder how it can be corrected. Yes! oh my gosh i am soo dissapointed because I had this game about 8 years ago and played it when I was young and it always shut off when I got to the maze. Now just last week I began thinking that I wanted to finally finish it. I bought it on ebay and the same thing happens! If anyone knows how to fix this, pleaseeee let us know! Actually, the first game was more “mein childhood”. Oh I can remember the countless hours I sat in front that ugly CRT screen, trying to convince the name listy thing to let choose a moniker that did not begin with “A”. I scrolled down for what may have been months before I realized the keyboard was THERE FOR A REASON. The agonizingly slow movement of the purple pant-suited Barbie, I soon became convinced that in fact, she was the perpetrator of the heinous crime of kidnapping Ken and stealing money that had been donated to orphans (or was it dolphins? My memory grows hazy). I would have much rather played as her gimpy sidekick with the computer, Becky. It was years before I mastered the game. And once I had mastered it, I promptly had another mystery on my hand as the CD and everything mysteriously vanished, departing forever to the Bermuda Triangle. Oh I loved this game! 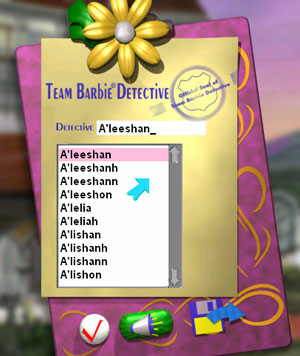 Though I liked the first Barbie Detective more, that one doesn’t work on my computer whilst the Holiday Adventure does. My game never used to freeze at the maze but yep it does now for me. The game can still be completed though. To complete the mystery you need to solve 3 of the 4 puzzles in the game (garden maze, lighthouse, piano, reception) – the game chooses a random 3 for you to solve. So if you play it enough times then randomly you won’t need to do the garden puzzle and it can be solved. It’s a bit heartbreaking when you have it that the last puzzle is the garden one! Saving and quitting doesn’t seem to change it either, the game picks which 3 when you start the mystery. 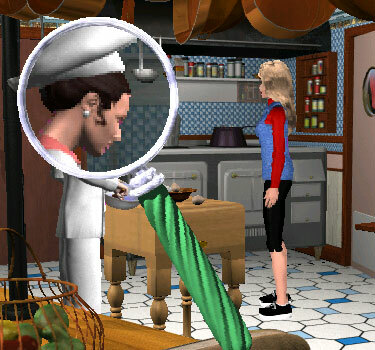 Happy sleuthing guys! :D And yes, catching the culprit is ridiculously difficult on all the modes. Just try and keep them in sight! @Lauren: Glad you enjoyed it. Thanks for telling me about Holiday Adventure. I haven’t heard of that one yet. I love your reports on these. They’re hilarious! Do you take requests? 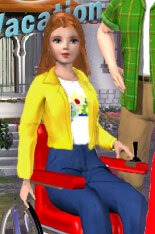 @Lauren: Requests are possible, especially if the game isn’t in the MobyGames database yet. ps is there absolutely no way to clear up this freezing problem? I have the same problem now, when i go to maze but when I was kid that worked correctly. I think it’s because of our windows. Nowadays our windows is 7, vista or xp and it’s hardly ever 98! This game needs only its own reqiurment.when I was kid, we used to have windows 98. And because of that the barbie worked correctly and now i can remember that beautiful maze. I hope my advise could help. My god, I didn’t even get to the maze because my game always closed when I tried to get into the gazebo. Ahhhh, I have a sudden urge to play and finish the game.